You know how I admitted a few weeks ago that I am a pasta-a-holic? Well I probably should change that to admit that I am addicted to one pot pasta dinners. I seriously can’t get over how easy they are and why they weren’t in my life sooner. [Slightly dramatized but only slightly]. They have become my new go to meal lately because everyone seems to love them. 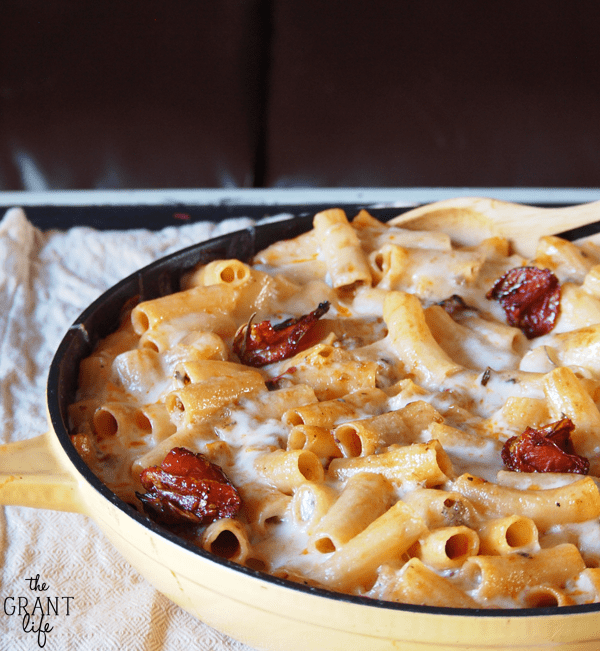 I can add this delicious roasted tomato skillet pasta to my ever growing list of pasta recipes. 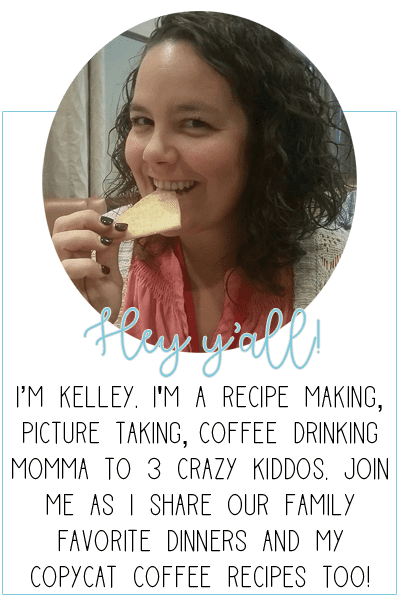 Pssst.. sign up for weekly recipe ideas plus two free printables! Have I sold you on skillet pastas yet? I promise after you make your first one you will be a convert. I know I was nervous when I tried them for the first time. I didn’t think the pasta would cook right, or that everything would come together. But oh was I wrong. The sauce and the water do a great job of cooking the pasta and then gets a little crispy under broiler. The cheese on top just seals the deal. Its just a one dish perfect kind of recipe! Saute your onion until translucent. Add your hamburger and spices and cook until no longer pink. Toss in your roasted tomatoes. Add the water and pasta sauce. Put the pasta in the in the skillet and push down under the liquid. Set to a simmer for 15-18 minutes. Check to make sure the pasta is under the water at all times and not sticking to the bottom of the pan. Add more water as needed. Remove from burner and add your cheese. Place under the broil for 3-5 minutes until the cheese starts to bubble. and the Rosemary Roasted Tomatoes that made this dinner possible! Yum! One dish meal-my very favourite thing. 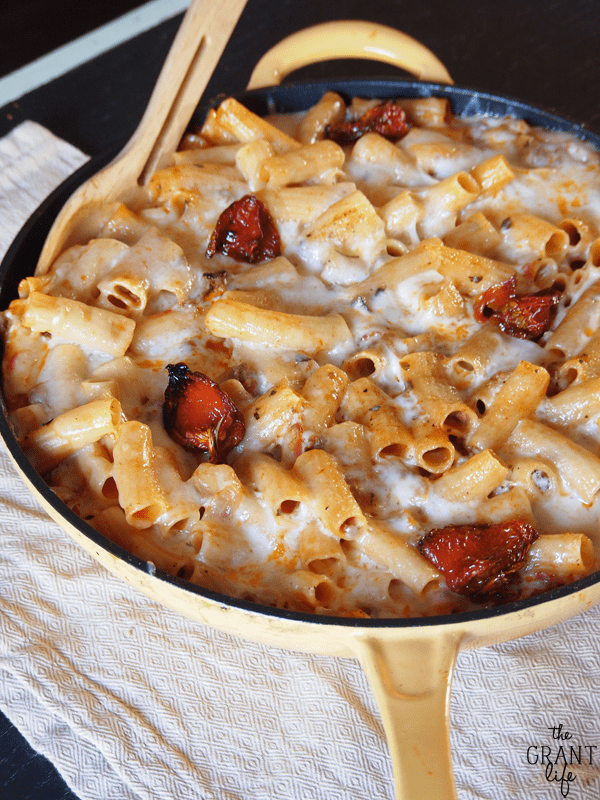 Kelley, I am totally a pasta-aholic and this is just feeding the obsession 🙂 Love that it is one pan and filled with cheesy goodness! Looks and sounds good. Please come share your great recipe at the Anything Goes linky, if you have not already. This pasta looks incredible, Kelley! 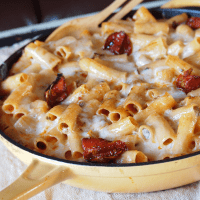 Pasta is such a go-to dinner and I LOVE the roasted tomatoes in this one….and the fact that you could mix it up and make it different every time! Thanks for sharing with us at Marvelous Monday….I’m a huge pasta fan. Pinned! Thanks so much Deb! We are big pasta lovers here too! 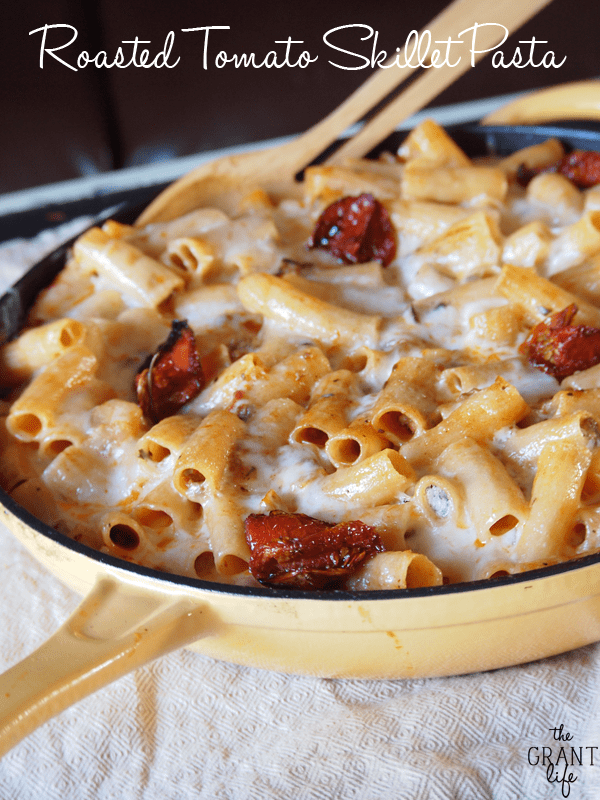 I can’t believe I’ve never made a skillet dish like this.. really simple and delicious. Thanks so much for sharing your pasta with us on foodie friday. So I totally clicked on your link without even realizing I was heading over to see your marvelousness! It’s a good night when that happens! Woo! You should totally link this up with me and my new link party girl! It could serve 6-8 people. Its a pretty large dinner. Excellent recipe! Love the roasted tomatoes! Thanks for sharing! Just wondering what size skillet to use? Would love to make this. Thanks! Its a 12 inch cast iron. Roasted tomatoes make me swoon. The end.